The 4 most famous sets with the “single-ended” long pole (Daan Tau Gwan) are “Six and Half Point Long Pole” (Luk Dim Bun Gwan), “The Flowing Water Long Pole” (Lau Seui Gwan), “Left-Handed Fisherman´s Long Pole (Jo Sau Diu Yu Gwan) and the “Ng Long’s Eight Trigrams Long Pole” (Ng Long Baat Gwa Gwan). It is often called simply “Eight Trigrams Long Pole” (Baat Gwa Gwan) and it is probably the most famous and most important weapon of the Hung Kyun system. Its roots reach all the way to the Sung dynasty (Song, 960-1279) and general Yeung Ng Long, the fifth son of a Marshall from the Yeung family, famous for its “Yeung family spear” (Yeung Ga Cheung), “the King of all Weapons”. The army led by Marshall Yeung and his sons was scattered in a battle against bandits and the Yeungs were surrounded and slaughtered except for the fourth, fifth and sixth son. Yeung Ng Long found refuge in a Buddhist temple on the Ng Taai Saan mountain and became a monk. 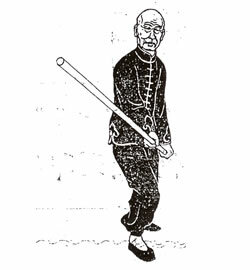 Moved by the compassionate philosophy of Buddhism, Yeung regretted his war crimes which cost many of his enemies their lives, removed the sharp tip from his spear and transformed the famous techniques of the Yeung family spear into staff techniques. The resulting long pole form has been passed for many generation. 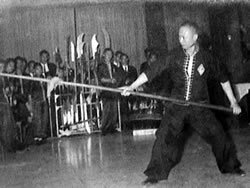 In today’s Hung Kyun, it is traced to one of the founders of the style, Luk A Choi and his student Wong Kei Ying (please subscribe to our Practical Hung Kyun Newsletter and download an old article about Wong Kei Ying’s Long Pole Challenge Match). The legend behind the “Eight Trigrams Long Pole” is very popular in China and was even adapted into a movie several times. The best rendition can be probably found in Eight Diagram Pole Fighter by Gung Fu master, actor, director and fight scene choreographer Lau Kar-Leung, one of the most important propagators of authentic Hung Kyun in Hong Kong cinema. It is no coincidence that Lau Kar-Leung is also a student of Lam Sai Wing´s disciple Lau Jaam (who by the way played his Sifu in the first black and white movies of the famous Wong Fei Hung series from the 50sand 60s). 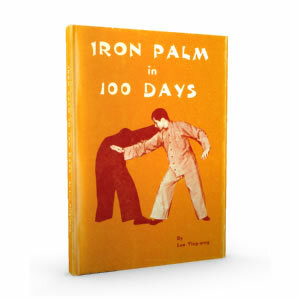 Wong Kei Ying’s son Wong Fei Hung became especially renowned for his skill with a long pole. 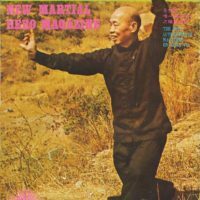 The father and the son were once performing their martial arts skills together with a famed master Jeng Daai Hung. In spite of Gwan´s mastery of the “Left-Handed Fisherman’s Long Pole” techniques, the Wongs attracted a much larger audience. Gwan felt offended and challenged Kei Ying to a duel. Wong asked his son, back then thirteen year old Fei Hung, to take the long pole and use the “Eight Trigram” techniques; Wong junior defeated his challenger effortlessly. 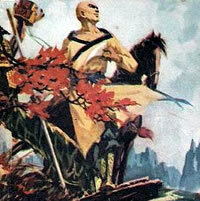 The tale of his victory reached all corners of China. 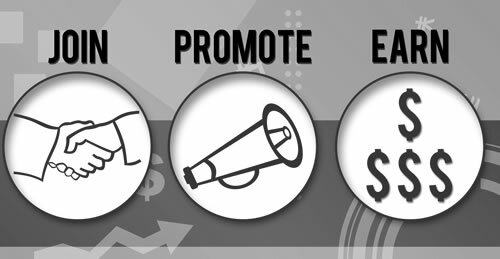 Many schools teach the Baat Gwa staff today, but only a few truly understand its sophisticated principles and are able to use it in a real conflict. As is apparent from the name itself, the techniques and concepts of the „Eight Trigram Long Pole” are connected to the canonical “Book of Changes“ (Cant. Yi Ging) and directly correspond with its cosmology and philosophy. „Eight Trigrams” return in Yam and Yeung. The “Great Ultimate” (Taai Gik; also “Proto-Image”, Yat Tou) represents the horizontal circle defining the action radius of a long pole. „Two Poles“ (Leung Yi, i.e. Yam and Yeung) describe circular clockwise and counterclockwise motions. “Four Images” (Sei Jeung) are 4 fundamental defense techniques (lower left/right block, upper left/right block) against attacks from the 4 main directions. “Eight Trigrams” represent eight primary offensive techniques. All techniques can be performed Yam or Yeung style, that is “soft” or “hard”. Techniques are performed in “Eight Directions” – forward, back, to the side and to the “4 Corners” – the combination of 8 techniques in 8 directions correspond with “64 hexagrams” (Luk Sap Sei Gwa). 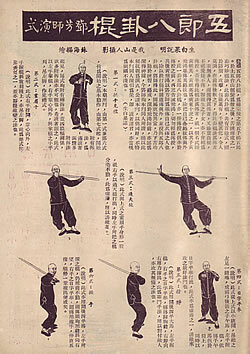 Because Wong Fei Hung´s best student Lam Sai Wing, the first patriarch of the Lam family Hung Kyun, had already been acquainted with the “Left-Handed Six and Half Point Long Pole” (Jo Gwan Baan Jung Luk Dim Bun Gwan), he later included its techniques in the “Eight Trigrams Long Pole” and thus extended the original 64 concepts into 70 and a half concepts (Chat Sap Dim Ling Bun Dim). 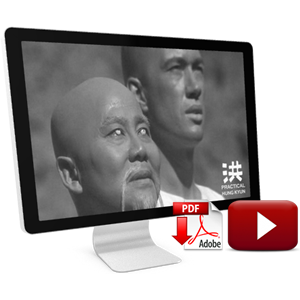 “Six and Half Point Long Pole” is taught on the 2nd level of Practical Hung Kyun curriculum. The proof of how important the “Eight Trigrams Long Pole” was to Lam Sai Wing can be found not only in “Eight Trigrams Long Pole Techniques” (Baat Gwa Gwan Faat), which describes the entire form (!) 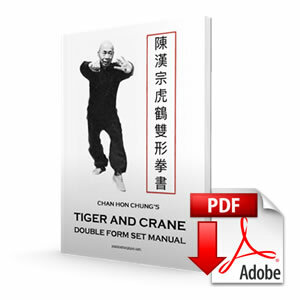 step by step and was released as an appendix to Lam Sai Wing’s “Taming the Tiger” Manual (available in our Eshop) but also the “Eight Trigrams Long Pole Sparring Set” (Baat Gwa Gwan Deui Chaak) which was created by Lam Sai Wing and is based on the original form. Lam Sai Wing´s heir and successor Lam Jou continued in his footsteps and wrote “The General treatise on the Eight Trigram Long Pole” (Koi Leun Baat Gwa Gwan) in the 1951 (published and recently translated among other key texts in Lam Sai Wing Memorial Book, available here). Another of Hung Ga Grand Masters, Dang Fong, published an extensive series of articles on Baat Gwa Gwan in a daily newspaper (click the picture on the right to purchase new Spanish-English edition of the Dang Fong’s manual). The standard length of the weapon itself is “seven feet and two inches” (Chat Chek Yi Chyun) which is approximately 240 cm. Longer and heavier staves are often used for strength development. Before the students get to practice the form as such, they go through conditioning drills and basic drills, combinations and key sections. The 14 key Baat gwa Gwan techniques (Sap Sei Yiu Kyut) are “Circle” (Hyun), “Point” (Dim), “Spear” (Cheung), “Cut (Got), “Curl” (Chau), “Cover” (Kam), “Lift” (Tiu), “Inside Sweep” (But), “Spring/Outside Sweep” (Taan), “Control” (Jai), „Mark“ (Biu), „Press Down“ (Ngaat), „Strike from Above“ (Haau) and “Strike from the side” (Gik). The practical use of techniques is practiced in the “application drills”, sparring form drills and the “Eight Trigram Long Pole Sparring Set” (Baat Gwa Gwan Deui Chaak). 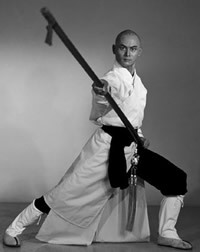 The philosophy of long staff fighting is concisely characterized by the proverb “the long pole doesn´t make a second sound” (Gwan Mou Leung Sing), meaning that the weapons should clash once at the most – the next technique should be fatal for the enemy. “Shadow” techniques and drill practice are also complemented by several special drills developing “skill” – practicing circling with the staff, stabbing at a static or moving target etc. This entry was posted in Hung Kyun Curriculum, Hung Kyun Research, Hung Kyun Techniques, Hung Kyun Videos on December 3, 2013 by Pavel Macek.